For upcoming training events browse the calendar below. If the training you are looking for is not listed please join our mailing list to be alerted to new courses and workshops as they are added. Why not give the gift of a workshop or money towards a workshop to a friend, colleague or family member. Letter design, letter drawing and letter carving in stone. We’ve been holding workshops tutored by some of the UK’s leading practitioners since 1999. Our letter design and carving workshops are a fantastic introduction into the skills you’ll need to fully enjoy, or even pursue a career in, the design, drawing and carving of letters. Our courses are suitable for complete beginners, professionals, and everyone in between. Master letter-carving artists Tom Perkins and Eric Marland will guide you through a fascinating, immersive and instructive course. You will be encouraged to try carving on three types of stone: limestone, sandstone and slates. If you’re a beginner, they will help you achieve the carving of a single letter or word… but a Shakespeare sonnet is not possible on this particular course. If you want to try a longer phrase, you can, but you will have to commit to trying just one type of stone. If you are more experienced, you may be able to carve and finish a longer piece. However, we do prefer you to create fewer well-designed crafted letters, rather than many hastily drawn and executed ones. Our letter design and carving workshops will introduce you to the skills you will need to fully enjoy and maybe pursue a career in this heritage craft. Experienced letter carving artists and calligraphers will guide you through every stage of letter carving in these fascinating courses. All materials provided and includes fresh tea, coffee and biscuits all day. TOM PERKINS - Tom studied calligraphy at Reigate School of Art and Design, and taught lettering for 15 years at the Roehampton Institute. Tom has an international reputation as a lettering designer and craftsman, with work in public and private collections. He has taught widely in the UK and in Europe, the US and Japan, and has influenced many other practitioners. Recent commissions include the opening plaque for The Queen’s Gallery, Buckingham Palace, and plaques for the British Museum galleries. He has written The Art of Lettercarving in Stone and has been widely published. Tom trained our apprentice Fiona Flack in 2009. ERIC MARLAND - After finishing the Art Restoration course at The City and Guilds of London Art School in 1985, Eric worked as a freelance letter carver in London until 1990. He then moved to Cambridge, working first for David Kindersely and afterwards at The Carving Workshop. In 1998, Eric set up his own studio in a deconsecrated chapel in Cambridge, where he has an established reputation for fine lettering and creative design. Eric trained Peter Hampson in 2004, and Jackie Perkins in 2012-2014. A new apprentice, Matt Loughlin will start his journey in 2018. You can book a six-day workshop, or choose to attend one of Tom’s or Eric’s three-day workshops. Please the Trust for information on booking these shorter courses. Workshops are held in Cambridge at The Old Chapel, CB3 0EA. All classes will be from 10.00 am to 6.00 pm each day approx. (including 1 hour for lunch break). Tea/coffee and biscuits are provided. Please make your own arrangements for lunch. Cambridge University Colleges – some Colleges are open to visitors for b&b, mainly during university vacations including the summer (June, July, August and September). Visit www.universityrooms.co.uk to check on availability and prices. NB: Churchill College is quite close to Eric Marland’s workshop. Bed & Breakfast - Tudor Cottage (tel. 01223 565212) is within walking distance of Eric Marland’s workshop – a number of people attending our courses in the past have stayed there. Please make your own arrangements for lunch, e.g. bring a packed lunch, or sandwiches, etc. can be bought from local shops (the nearest one is about 10-15 minutes’ walk away). The Art of Letter Carving in Stone by Tom Perkins (published by Crowood Press) – (Also available from the Lettering Arts Centre) Creative Lettering Today by Michael Harvey (published by Black). This is his three-books-in-one: Drawing letters, cutting of letters, and digital letters. Calligraphy Made Easy by Gaynor Goffe - out of print but available on Amazon. A3 pad of lay-out or cartridge paper, Ruler, HB pencil, eraser, compasses, set-square (plastic triangle). Stone is heavy. We insist for the sake of your toes that you wear steel toe-cap boots or shoes. You can buy steel cap boots or shoes from builders’ merchants or tool hire shops. Stone can splinter. We will provide safety glasses for your workshop, which you must wear. 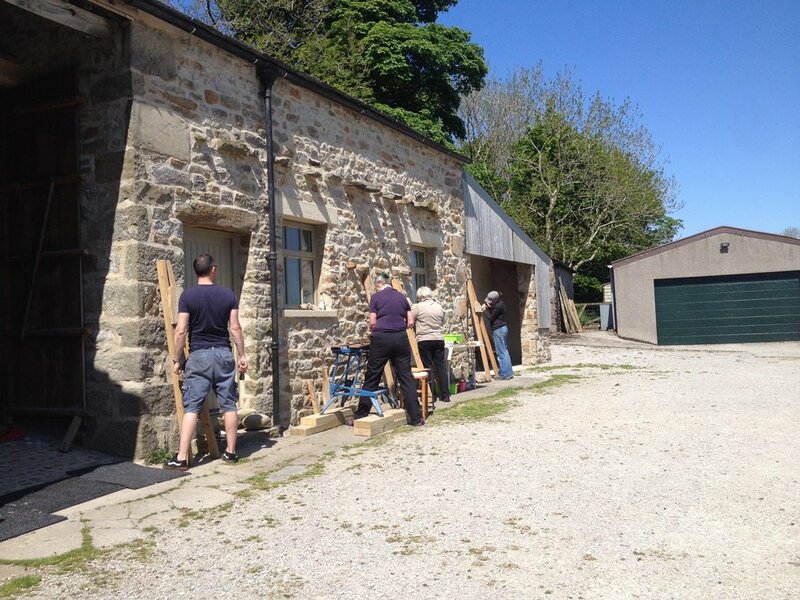 Pip’s workshop is for eight students, shaped to individual needs, and hosted at Broadrake, Chapel-le-Dale, Ingleton, LA6 3AX. www.broadrake.co.uk/directions.html It’s very important to read the directions carefully as a mobile signal is not available if you have trouble finding Broadrake. Course length is three days. You will be encouraged to try carving on 3 types of stone: ie limestone, sandstone and slates. A single letter or word will be achievable, but a Shakespearean sonnet is unrealistic. If you do decided to carve a longer phrase, it will be at the expense of trying other types of stone or slate. All materials are provided, please bring your own if you prefer. Lunch is available for a small fee payable separately. An introductory slide show will be followed by demonstrations of lettering styles, drawing techniques and methods of carving with chisels, and much individual tuition. Stone, tools and materials are provided, though students are welcome to bring their own stone and project. PIP HALL - has been running a carving studio for 16 years. She has carved inscriptions for commemoration and celebration, house signs and garden features, as well as carrying out public art commissions and exhibiting. Pip’s work also includes lettering and illustration for books, and for interiors, such as floors and walls. The Art of Letter Carving in Stone by Tom Perkins (published by Crowood Press) – (Also available from the Lettering Arts Centre) Creative Lettering Today by Michael Harvey (published by Black). This is his three-books-in-one: Drawing letters, cutting of letters, and digital letters. Letters, Slate Cut by David Kindersley (published by Cardozo Kindersley Editions) Letter Cutting in Stone: a workbook by Richard Grasby “Calligraphy step by step” by Gaynor Goffe with Anna Ravenscroft, and the popular “Calligraphy Made Easy” out of print but available on Amazon. The purpose of this course is to enable letter cutters to understand why the pen is important in the learning of letter forms. The better informed we are the better the drawing hand becomes. During this five-day course Christopher Elsey will explore with you the importance of the pen in the learning of letterforms. You’ll learn Roman Minuscules, Roman capitals, and italics. Pen writing forms, double pencil work, pen forms, chisel-edged brush forms will all be explored. You will learn to adapt the calligraphic form for letter cutting, taking into account the stone or table it is intended for. A visit to Ditchling Museum and Ditchling church are part of this fascinating course. Day 1. AM: Introduction to the course: short talk with projected images; setting up drawing board and sitting position. Pen exercises. Roman miniscules – to include: skeleton forms drawn with pencil; pen writing of forms; double pencil work. Day 2. AM: Continue to develop the Roman Minuscule. PM: Roman capitals: skeleton forms, pen forms and chisel edged brush forms. Day 3: AM: ITALIC; skeleton forms and pen writing forms.. Pub lunch in Ditchling. PM: Visit to Ditchling Museum & church. Day 4: AM: Continue with italics using the pen and double pencils. PM: Learning to adapt the the calligraphic form for letter cutting, taking into account the stone or slate it is intended for. Day 5: Group discussion to address questions from students. Drawing letters using a single pencil, using the calligraphic knowledge gained on the course. CHRISTOPER ELSEY was taught and mentored in letter carving and drawing by Tom Perkins. He received formal training at Reigate School of Art and Design, gaining a Design HND in Lettering. He continued study at degree level in calligraphy at Frobel College, Roehampton. In 2000, he was elected to full membership of Letter Exchange and has exhibited at several venues in London and the south of England. His work was recently published in Tom Perkins’ book The Art of Lettercarving in Stone. His work is included in The Memorial Arts Charity’s (now The Lettering Arts Trust) 2009 exhibition Art & Memory – the launch of the National Collection of Contemporary Memorial Art. Chris, with his studio partner Geoff Aldred, trained our seventh apprentice in 2012-2014. Please bring along a layout pad, steel rule, pencils and enthusiasm. Our letter design and carving workshops will introduce you to the skills you will need to fully enjoy and maybe pursue a career in this heritage craft. Experienced letter carving artists and calligraphers will guide you through every stage of letter carving in this fascinating course. A five-day workshop focusing on learning, improving and experimenting with various scripts depending on your experience and requirements. Beginners and advanced students are welcome. All materials provided and includes fresh tea, coffee, and biscuits all day.